While most tourists to Camiguin Island only see the great beaches, hot and cold spring waters or falls, the place has these and many more besides. 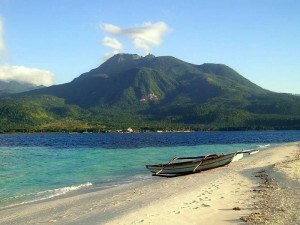 As its name suggests, Camiguin Island, or “the island born of fire,” also offers great outdoor adventures and rare opportunities for visitors to camp near its old volcano crater, as well as experience the adventure and thrill of going through dense forests and feel the coolness of springs, which are rich in endemic plants and animals. The four-hour upward trek to the summit of Mt. Hibok-Hibok starts when climbers jump-off from Ardent Spring. Another entry point is in Tibulid, Yumbing, still in Mambajao town which runs little farther, but taken by those who prefer to camp in for a night. Roberto S. Rufino, Protected Area superintendent and officer-in-charge of the Forest Management Service of the Department of Environment and Natural Resources (DENR) in the province said visitors are discouraged to camp in the summit for their safety but can be accommodated instead in an equally beautiful spot along Mt. Hibok-hibok’s old crater, where they can take in the majestic view of the placid crater lake. Rufino said the crater is safe as its bed is compact, but still they discourage guests from dipping into the water. “From the summit, where the mossy crater formed from its past eruption can be seen, you get a good view of the nearby White Island, Bohol Sea to the north, and the Macahalar Bay in Cagayan de Oro and Siquijor Island to the west. Around its summit are several small craters filled with water, which experts say are really where the burning lava flowed and are now hardened into water containers with bowl shapes and formed into shallow lakes. Climbers are also advised to descend early in the morning before the clouds start rolling in and block the majestic view in the later portion of the day. “Mt. Hibok-Hibok is now fast becoming a popular hiking destination on Camiguin island and is popularly known among foreign tourist, as almost half of them always go for the climb,” Rufino said. He reminded interested climbers to secure permits from their office, adding that no visitors are allowed to climb in the area without guides. “It is important to secure permits and undergo basic orientation, especially, for the first timers and be provided with capable tour guides who are more familiar with the terrain,” he clarified. He also said Mt. Timpoong is a magnet to researchers, as numerous scientific researches were conducted here and have come to identify and fingerprint various endemic plants and animal species.